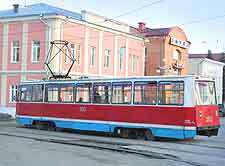 The various transport options linking this part of Siberia and fairly comprehensive and Tomsk is both easy to reach and travel around. Tomsk is well connected to Russia's capital of Moscow by both train and air, with the local air facility being Bogashevo Airport (TOF). 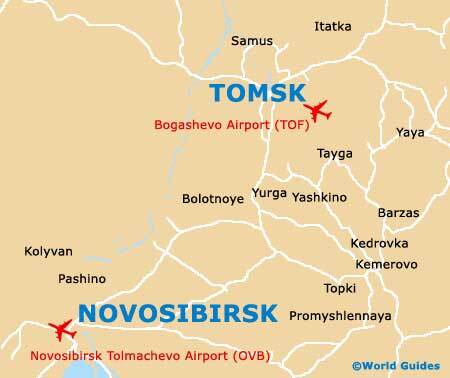 However, slightly further away, the Novosibirsk Tolmachevo Airport (OVB) is located in Ob Town and offers a large choice of flights, along with regular bus transport to and from Tomsk bus station, with at least five direct buses travelling each day. Bogashevo Airport serves Tomsk and much of the region, and lies close to the village of Bogashevo. Founded in 1967, this is an established facility and the Bogashevo Airport has recently celebrated in 40th anniversary. The main airlines include KrasAir, Rossiya, S7 Airlines (Siberian Airlines) and also Tomskavia. Direct flights to Moscow are available here and provided by both Rossiya and S7 Airlines. Novosibirsk Tolmachevo Airport is around 16 km / 10 miles from the city of Novosibirsk and dates back to 1957. Within easy reach of Tomsk and featuring two busy terminals and around 20,000 flights each year, annual passenger levels are now rapidly approaching two million. Prominent airline at the Novosibirsk Tolmachevo Airport include Aeroflot, S7 Airlines and Transaero, allow of which provide competitive flights to Moscow, while both Rossiya and Yakutia are good choices if St. Petersburg is your chosen destination. 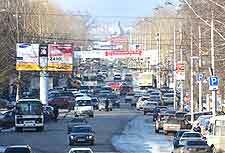 Renting a car is the preferred mode of transport for many a visitor staying in Tomsk and both of the neighbouring airports will be able to oblige. Car hire allows you to travel outside of the city and visit neighbouring tourist destinations, such as Minusinsk and Novosibirsk. however, since the Siberian winters in Tomsk can be severe, renting a car is really only recommended during the warmer, frost-free summer months. Book your Novosibirsk Car Rental here. The inner-city area of Tomsk is well served by minibus transport, which are known locally in Russian as 'marshrutnye taksi'. In total, there are around 40 different minibus routes spread around the city, along with just over ten bus routes. Both electric trams and trolleybuses also provide a cheap and enjoyable way to travel around the city centre and lend themselves to those choosing to sightsee. There are two railway stations in the city. 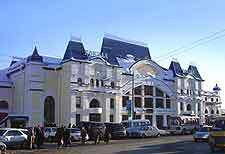 Tomsky I is the main station and offers daily trains which travel to Yaroslavsky Station in Moscow in around 56 hours. Further trains travel to Barnaul (14 hours), Irkutsk (34 hours), Krasnoyarsk (14 hours), Omsk (15 hours - summer only) and Tyumen (22 hours).